The immediate area around Mosquito Lagoon Fish Camp may be short on nightlife, but natural and human history, great local seafood, world-class sunrises and sunset, and incredible wildlife viewing are plentiful. Just 20 minutes north of the camp, New Smyrna Beach is a charming, historic surf town with great dining, shopping, and beaches. The most popular option in Oak Hill is the excellent Goodrich Seafood and Oyster House, an easy walk (or drive) south from the camp along River Road. Goodrich's is also accessible by boat. Several family-run diners nearby on U.S. 1 also offer good breakfasts and lunches. Also accessible by boat is the famous JB's Fish Camp, on the east shore of the lagoon. Depending on your draft and how well you know the area, plan around a half hour to get there by boat. Just to our north via U.S. 1, there are numerous restaurants in Edgewater and New Smyrna Beach, ranging from fast food to fine dining. Picturesque Flagler Avenue in New Smyrna is a great place to spend an afternoon strolling and shopping. Along the way, you'll pass plenty of eateries and watering holes like Clancy's Cantina and Cafe Verde. Directly across the lagoon from us is Canaveral National Seashore, with 24 miles of pristine beach, much of it roadless. A particularly beautiful section of it is accessible via a short boat trip across the lagoon from the camp. Just beach your boat on the inland side of the barrier island, and walk 100 yards across the dunes to the Atlantic Ocean. Several historic sites, including Turtle Mound, Seminole Rest, and the Eldora House, are also part of the Seashore. North of the Seashore, the beaches of New Smyrna offer a much different experience. Most are open for driving, allowing you to drive and park on the hard-packed sand for a small fee. Within the lagoon system, there are a number of popular beaches and sandbars accessible only by water. The best known is Disappearing Island, just inside Ponce Inlet, a little over an hour north of us by water. There are several closer options, though, all of which are great places to cast net mullet, hunt shells, let your kids pester hermit crabs, or just put your feet up and watch the afternoon go by. 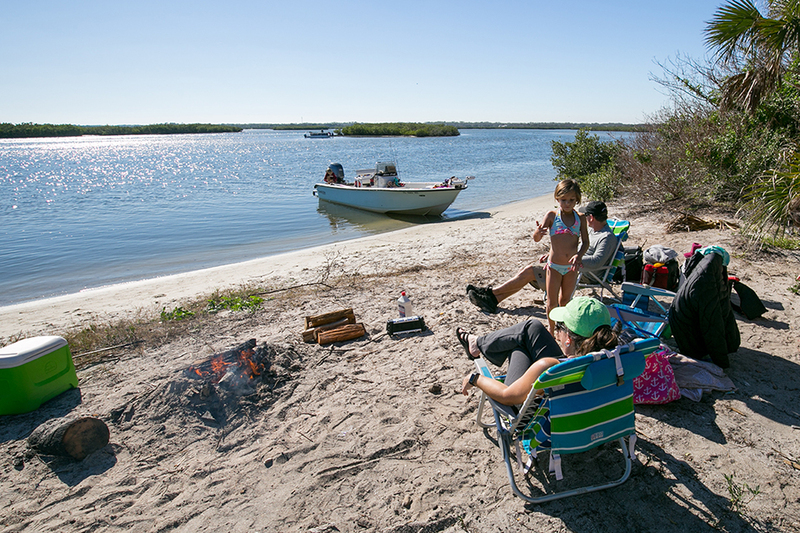 The camp is a perfect Central Florida getaway for kayakers and stand up paddle boarders. Bring your own kayak or SUP or use one of our complimentary kayaks. Start each day from our private ramp and paddle a short distance across the Intracoastal Waterway into the mangroves and secluded islands of the Mosquito Lagoon. If you are interested in using one of the complimentary kayaks, let us know as soon as soon as possible. We will reserve it for you during your stay at the camp. In addition to restaurants and bars, New Smyrna Beach and Edgewater are home to a wide variety of museums, galleries, parks, shopping, and historic sites. A 10-minute drive to our south is Merritt Island National Wildlife Refuge, where 1,500 species of plants and animals inhabit 140,000 protected acres. One of the highlights of the refuge is Black Point Wildlife Drive ($5/vehicle), a seven-mile loop through pine flatwoods and marsh impoundments, where alligators are common. If you have the time and inclination to venture out of our immediate area, the entertainment options are tremendous. Daytona International Speedway is 35 minutes to our north, the Kennedy Space Center Visitor Complex is a very scenic 45 minutes to our south; and Orlando's world-famous theme parks are about an hour and fifteen minutes to our southwest.